All coaches probably have different names for it—maybe ping-ping-ping or tungo-tungo-tungo or maybe just “Move it quick!” But whatever the name, coaches and winning teams realize the value of having the basketball click from one player to another. A click is when the ball comes into your hands and goes out again in an eighth of a second. Not a second later, after you look around. Not a moment later, after you first check to see if you can get a shot. But immediately. You catch the ball, you throw the ball–like a second baseman on a double play. The only way you can make a click pass is to know before you get the ball what you are going to do with it. That takes good court awareness. Larry Bird, one of the greatest basketball players in the history of the game, was a master of click passes. Considering what a great shooter he was, it would seem as if he would have had an excuse for holding the ball and looking around all the time. But every game, he had dozens of click passes, passes that just barely touched his hands before he was sending the ball on its way to a teammate. Naturally, if you have good enough court awareness to pass the ball immediately to a teammate wide open, that’s great. But even if you don’t, if you concentrate on throwing 10 to 12 click passes per game, even if the passes don’t go to the “right” man each time, you still will be helping your team. Click passes not only help team morale and look impressive, but even when they are thrown to the “wrong” guy, they still put enormous pressure on the defense because the ball is moving so quickly from one position to another. You cannot be a good basketball player simply by passing the ball immediately after you get it; but you would hardly ever hurt a good team by doing that, and you would help them often. The point is that most players hold the ball too long most of the time. It is difficult to make this any more emphatic. You may miss an open man someday, and the fans or coach may groan for a moment, but you don’t lose many games by clicking the ball. You lose them by holding it too much. This is not to say that you should treat the ball like a “hot potato” and just flip it out of your hands without even knowing where a teammate is. But often you should get rid of the ball quickly, when you can. Plan to get 10 clicks a game. If you can talk your teammates into doing the same, your team will be much better. 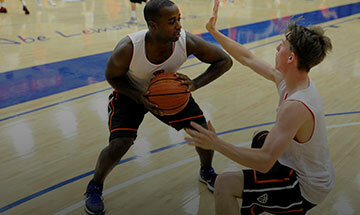 Click passes will put the ball in scoring position or dangerous position “like magic” against man or zone defenses. You will probably be surprised at how much easier it is for your team to score by this simple effort. Click, click, click. Get 10!